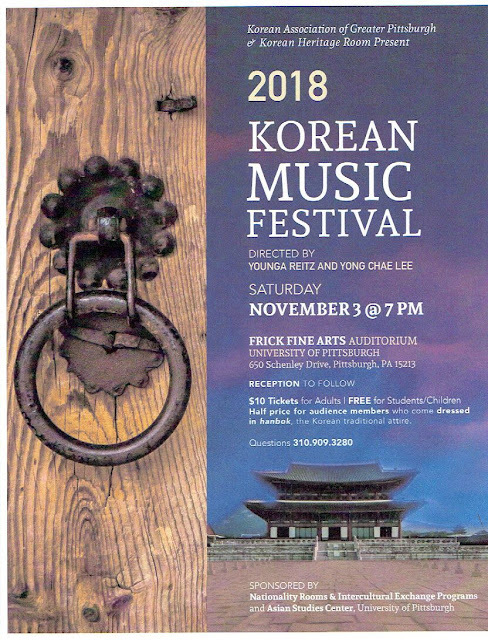 PennsylvAsia: 2018 Korean Music Festival, November 3. The Korean Association of Greater Pittsburgh and the Korean Heritage Room will present the 2018 Korean Music Festival on Saturday, November 3. It will start at 7:00 pm at Frick Fine Arts Auditorium in Oakland (map). The event is $10 for adults, free for students and children, and half-price for those who come dressed in hanbok.